Opportunity for Hertz Furniture Customers to Receive $25 Rebate. 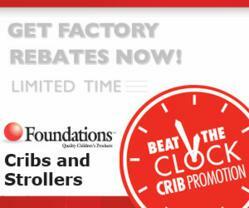 Get Factory Rebates on Foundations Cribs & Strollers! Hertz Furniture is proud to carry a full range of certified commercial daycare cribs designed for heavy, daily use in a commercial setting. Hertz Furniture, leading source for institutional, school, and office furniture, today announced that Foundations, a premier brand offered by the veteran furniture supplier, is giving a rebate of up to $25 on the purchase of select cribs and strollers. The promotion on strollers and certified compliant cribs runs from August 2 through September 30. This special is timed to coordinate with the Federal deadline in December to purchase certified compliant cribs. The U.S. Consumer Product Safety Commission (CPSC) and the American Society for Testing and Materials (ASTM) are consumer organizations with a mission to monitor consumer products, test products, and develop standards to protect the public. The CPSC released new standards for safe cribs in 2010; all cribs sold after June 28, 2011 must be compliant with CPSC safety standards 16 CFR 1219 (for full-size cribs) and 16 CFR 1220 (for non-full size cribs). However, daycare centers, hotels, and crib rental companies have been able to continue using non-compliant cribs currently in use. By December 28, 2012, all cribs must meet the new crib standards. Cribs that meet the new standards do not have drop-sides or wood screws and have crib slats with enhanced strength. For more information, see the CPSC summary of new Federal requirements. Hertz Furniture carries a full selection of Foundations cribs. One model popular with quality daycare centers is the First Responder Evacuation Crib. This crib is the top-of-the-line in safety. Especially designed for fast and safe evacuation in case of an emergency situation, the crib has Clearview end panels to let caregivers monitor infants throughout an evacuation. Easy-grip handles are integrated into the headboard frame to facilitate stable and secure transport. The mattress, wet-proof and anti-microbial, meets the latest in Federal fire standards. Sanitizing the crib is easy because a plastic teething rail protects both the baby and the crib. For over 45 years Hertz Furniture has supplied schools, religious institutions, businesses and government offices with top quality commercial furniture and superior customer service. Speedy Quotes, Quick Ship products, a wide selection of Eco-Friendly furniture, a free Project Planning and Design service and the best warranties in the industry are just a few of the ways that Hertz Furniture provides added value to its customers. For additional information on Hertz Furniture and its extensive line of products, please visit Hertz Furniture, speak to a furniture specialist at 888-802-6549, or send an email to ahoffmann (at) HertzFurniture (dot) com.